In humor—as in wine—veritas. In satire there is always some distilled truth, especially with Stewart, whose “fake” news so often, better than any other news source, reveals deep, denied, unpalatable and unrecognized truths. Once again, Stewart delivered as the host with the tinkly toast to the truth as well as the merciless roast. Well, suppose we do think about it that way. Is Stewart onto something? And, if he is, how much of a problem is it—is job hogging rife and increasing [a question addressed below]? What’s Wrong with “Job Hogging”? 1. Do the math: If I have three jobs and two other people have none, the latter remain in the ranks of the jobless. So, my cobbled approximation to “full employment” comes at the expense of others, thereby perpetuating, if not exacerbating, widespread unemployment. 2. It is reasonable to conclude that among those holding three jobs, there will be a significant number who are underemployed, e.g., degreed graduates forced to jury-rig multiple, low-pay or otherwise unappealing jobs completely unrelated to their ambitions and degree, in order to financially survive. To the extent that they are “multiply underemployed”, i.e., “hyper-underemployed”, the argument #1, above, applies. From the perspective of the unemployed, whether or not those graduates are holding down multiple jobs with extreme or any reluctance or under duress, the latter are job hogging. 3. Job hogging—“hyper-employment”—is similar to hyper-inflation: In both instances, securing the necessities, not to mention the luxuries of life, becomes harder and harder over time. In the case of hyper-inflation, more devalued dollars are required to obtain them—and, in the worst case scenario, obtained with bushels of virtually worthless currency, as was the tragic and familiar case of the post-WW l German Weimar Republic hyper-inflation. Replacing “dollar” with “job”, the hyper-inflation narrative becomes a hyper-employment scenario: More and more jobs are required to get by and to secure life’s necessities; at first, two jobs per family—after the eventual extinction of the 1950s iconic sole bread-winner husband; then the working couple holding down one job each, with kids; then the working couple holding down one job each, but with no kids [the so-called “DINKS”]. This morphed into the working couple with at least one partner holding down two jobs; then the couple holding down two jobs each, with or without kids; then couples holding down three jobs each. If that is not the hyper-employment limit, it must be close to it—unless we repeal various child labor laws or somehow employ family pets. In any case, statistics reveal that Americans now work more than anyone else in the industrialized world—a far cry from the medieval serf who, in many instances, had to work only six months out of the year. Viewed from this historical perspective, a second form of hyper-employment, in the form of more hours per job or at multiple jobs, has grown steeply, even if not exponentially. The main difference between hyper-employment and hyper-inflation is that although hyper-inflation can be runaway and exponential, hyper-employment cannot, since the number of jobs anyone can perform or the number of hours available for any one job is limited by our finite reserves of energies and available time. But, this mathematical difference notwithstanding, the stark fact remains that both crushing devaluations of currency and of labor, if unchecked, lead to one result: collapse and instability—of an entire exhausted economy as well as of its exhausted individuals. Job Hogging: a Growing Problem? Conceding that hyper-employment contributes to unemployment and to various adverse consequences, the question remains: How widespread is hyper-employment and what is the trend? Surprisingly, despite this recessionary era of declining wages, declining middle-and-working class net worth, declining purchasing power, increasingly irrelevant job qualifications, expanding automation and robotization of jobs, shrinking job markets, vanishing job categories, unmanageable health insurance costs and coverage disqualifications, the percentage of hyper-employed Americans declined from its 1995 peak of 6.2% to 5.2% in 2009. One might have expected that as average wages and hours have declined, the number of workers forced to hold down multiple jobs would have increased. But that would be a risky conclusion, since that argument merely makes the case for increased demand for multiple jobs, not for supply of them. Offsetting their demand for more jobs is the harsh fact that job creation numbers have neither fully rebounded from the 2008 crash levels nor kept up with that demand, regardless of how desperate and willing those workers are. Recently returned from a Daily Show 3-month hiatus—during which time he was on location in the Middle East, as director and producer of his drama, “Rosewater”, Stewart has, in effect, been hyper-employed this past year, although probably not because of financial duress, given that at an estimated $25-$30 million per year, he tops the income charts for variety show hosts. Not only has he not suffered among the ranks of the hyper-employed, we haven’t either, from the “edutainment” standpoint, given that his film will probably be as enlightening and engaging as everything else he does. However, there is an additional job that he might want to consider taking on. 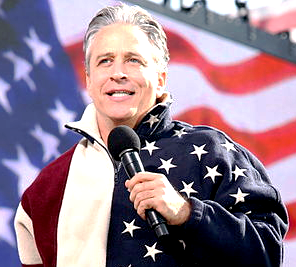 Hosting a second and prime-time Daily show—even if just for us. Note: For an alternative, contrasting concept of “hyper-employment” as a surplus of unfilled jobs in an economy near full employment, see this.